Exceptional book by Rabbi Yaakov Kleiman on the "Kohain Gene" and Jewish Genetics in general. Cannot recommend it enough. Rabbi Yaakov Kleiman is director of The Center for Kohanim (Jews of Priestly origin), which is dedicated to raising awareness and preparedness among today’s Kohanim. The Center, located in the Old City of Jerusalem, maintains the website: Cohen-Levi.org. Sparked by the discovery of the "Cohen Gene", Rabbi Kleiman began researching the new science of molecular population genetics – the tracking of peoples’ history through DNA. This book presents a summary of the fascinating findings and their possible implications. 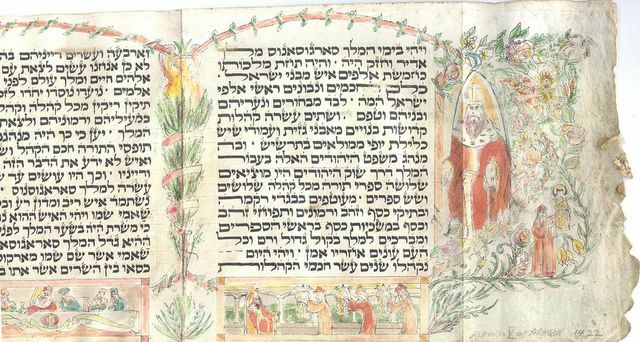 Did the Twelve Tribes of Israel really exist? Are the scattered groups of modern Jews really the direct descendants of the ancient Hebrews of the Bible? This extraordinary book chronicles the latest discoveries in the cutting-edge field of Molecular Population Genetics that add empirical evidence and scientific confirmation to Biblical tradition. 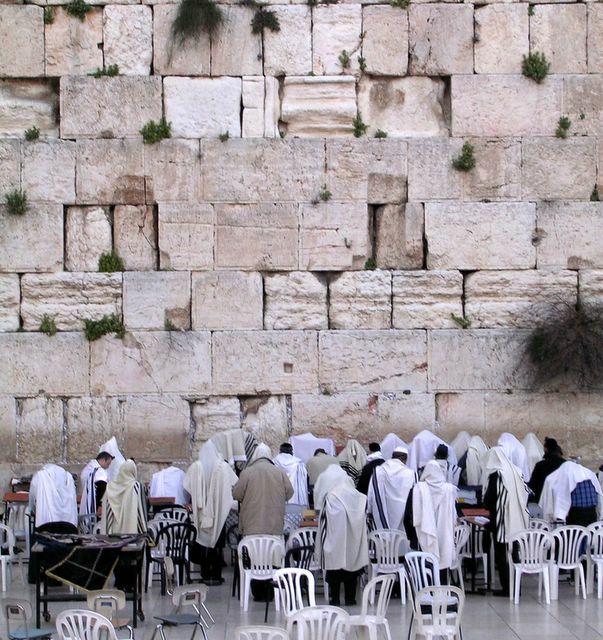 Arabs Vandalize Judaism´s Holiest Site. From Arutz Sheva. Click above. Youth from Kibbutz Maoz Hayyim in the Jordan Valley have asked to meet with residents of Gush Katif, but their parents are nervous their children will change their minds about the expulsion. Me: I was afraid that with the fall of the Soviet Union there wouldn't be any Communists left to oppress and brainwash Jews. Thank goodness for the G-dless Kibbutzniks! Welcome Home Brothers and Sisters! Rabbinate Recognizes Bnei Menashe as “Descendants of Israel"
Here is a cool picture my wife took of me blessing the People of Israel at the Western Wall. (click on the picture to enlarge it). 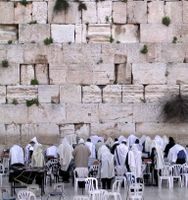 Note: Kohanim face the congregation with a Talit over their heads and hands as they bless. This week's award isn't so much for the web site as it is for the actual site. When I was in Jerusalem I went to visit the Har HaBayith Information Center in the Old City. The man who worked there is a Holy Levite and one of the sweetest guys you'll ever meet. Truly a Holy man and an incredible asset to the Jewish People for the work he is doing. Please, if you are in Jerusalem, visit him and his center. 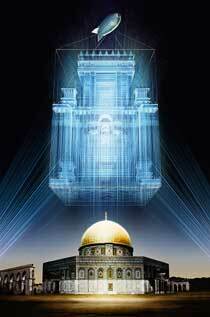 They have a great model of the Third Temple from Ezekiel's vision. I was walking near Ben Yehuda Street when five or so Israelis in their early twenties burst out of a bar dressed in costumes. They were shouting "Hag Samayach!" (happy holiday). I was so happy to see my young brothers and sisters celebrating Purim with such joy (albeit a bit early). I realized they were celebrating St. Patrick's Day. Me: How can you celebrate a Catholic holiday? You're Jewish. This is Jerusalem. Where's your dignity? Where's your pride? Them: We have our pride. We celebrate every holiday. Me: Do you fast on Ramadan as well? to which they became confused and had no answer except to tell me to "f**k off." How do you ask these people to serve in a Jewish Army and defend the Jewish homeland? How do you expect them to give their lives to defend something which they feel is inadequate and unimportant? Where is the education? Where is the exposure to Judaism? This is why we are losing and this is how Israel is failing. We have started the book of Leviticus this week. I urge all of our readers to study this book of the Torah and see what the service was like in the Holy Temple. This is the consecrated portion of Aaron, and the consecrated portion of his sons, out of the offerings of the LORD made by fire, in the day when they were presented to minister unto the LORD in the priest's office; which the LORD commanded to be given them of the children of Israel, in the day that they were anointed. It is a due for ever throughout their generations. Pollhost had a major crash leaving most of its polls unusable. Just before I returned my rental car, a girl walked up to me and handed me a bumper sticker whic read: "Yehudi Lo Migaresh Yehudi" A Jew does not expell another Jew. I liked the sentiment and put it in my pocket for my return. As I entered the car rental place, the young, secular Israeli woman behind the counter commented on the sticker saying it was "stupid." I asked her why she would think that and she responded that Israel should give up everything if it will bring peace. I asked her, even Jerusalem? She responded "yes." I said ""even Har Ha-Bayit?" She responded "yes." I asked her "even Tel Aviv?" to which she seemed confused and had no answer. A very happy Purim to all. Remember what Amalek did to us when we left Egypt. How he struck at our weakest. Remember how he tried to annihilate us in Persia. Remember how he tried to destroy us in Europe and remember how he still attacks us today. But also remember that G-d has saved us each and every time. Eat. Drink. Be merry for Hashem is with us! Judah HaKohain returns from Jerusalem! I just got back. So many emotions. So many stories. I need to collect my thoughts and I look forward to sharing them as well as some great pictures with you. "Remember what Amalek did to you as you were leaving Egypt. How he happened upon you, and struck the weakest people trailing behind, when you were exhausted. And he did not fear G-d."
May Hashem destroy Amalek and bring the complete Redemption for the whole world! Why go looking for other sites? I have been a fan of this site since I began this blog. Let's give him the praise (and traffic) he deserves. Cave of the Patriarchs Attacked! Where is the outrage? Where is the global condemnation? It seems that even our forefathers and mothers are not safe from terrorism. Congratulations to all who participated in the 2005 Siyum HaShas. 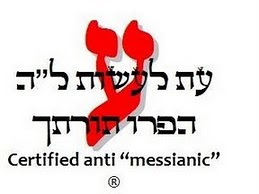 I have decided to start the Two Hands Up Award for the best pro-Israel, Jewish or Noahide sites that I come across. I am proud that there are so many out there who are working tirelessly to promote Judaism, Torah, Israel, Jerusalem and the Seven Laws of Noah. I am amazed at the hard work and dedication, so I decided to give my "hechsher" to those sites I find to be the best of the best. Who else but Hasidic Gentile to point this out to the masses? You know what, I'm not giving you the link. You have to visit his site to get it. You won't be sorry you did. Check out all his other stuff too. No comment needed. Click here.